« MacVector 16 and macOS High Sierra 10.13.4. 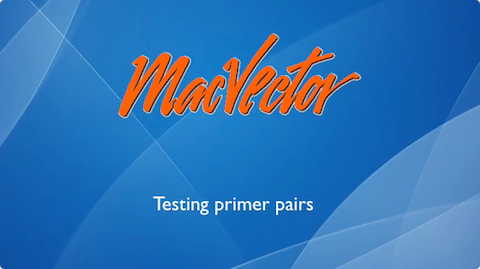 MacVector has many primer tools to make designing, analyzing and cataloging your primers easy. Here are a few typical workflows. You can design a set of primers to amplify a gene in as little as three mouse clicks. Open the MAP view, and click on a feature. Go to ANALYZE > PRIMER DESIGN/TEST(PAIRS). You will get a ranked list of the best primer pairs to amplify that feature along with a spreadsheet table, that you can copy and send to your oligo synthesis service. Design a single targeted primer with a tail. QuickTest Primer tool gives great flexibility for designing primers with tails or mismatches.You can slide your primer along your template to find the optimal sequence. You can add mismatches and view their affect on any CDS features. You can add restriction sites too and view “one out” sites. Select a 20 bp region around the location you want your primer to be. Click ANALYZE > QUICKTEST PRIMER. Slide the primer along your template until the oligo is optimal. Add a restriction site or mutation in the optional tail. Hover over a green (or red) putative restriction site to view the change to your sequence. Double click on that putative site to add to your primer. Watch how the coding is changed. Click Add to Database.. to save your primer. How do I test a pair of primers?. You can map pairs primers against your template to see how well they would amplify your target. Go to ANALYZE | PRIMER DESIGN/TEST(PAIRS). Storing primers in the Primer Database. 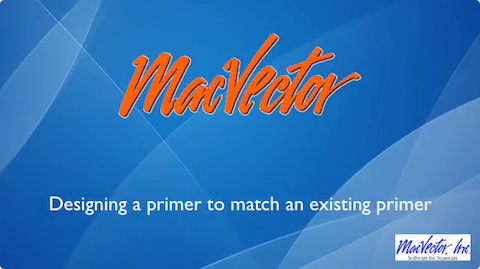 MacVector’s Primer Database allows you to save and retrieve regularly used primers. You can also scan sequences for potential primer binding sites using Primer Database Search. The tool comes with a starter database of primers, but you can use existing subsequence files or import primers from Excel. To save a primer from QT Primer to the Primer Database. To save a primer from Primer Design to the Primer Database. The Primer database allows you to store your own collection of primers. You can design new primers to match regularly used ones. Switch to the Map tab and select the region you want to amplify. This entry was posted in Techniques, Tips and tagged pcr, primer3. Bookmark the permalink. Both comments and trackbacks are currently closed.